Background: Nano-crystalline suspensions obtained by top down process are used to overcome the poor water solubility of Active Pharmaceutical Ingredient (API). Discussion: Nano-crystalline suspensions are a versatile technology and can be used for administering drug via different application routes. They are manufactured mainly by using technologies like stirred bead milling and high pressure homogenization. 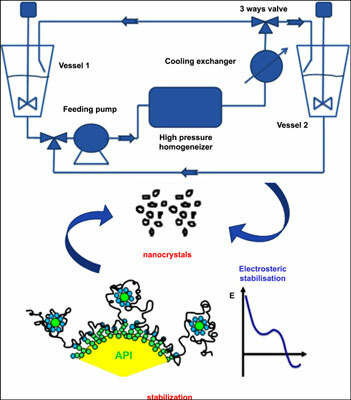 To make nano-crystalline suspensions successful as drug delivery system, several aspects needs to be considered in terms of formulation composition, manufacturing process and the technology to be used for particles size reduction. Conclusion: This paper reviews all above aspects though eyes of engineer and industrial production feasibility. In addition to that, this review outlines importance of technology selection to obtain the desired particle size and product in compliance to pharmaceutical regulation. Finally, the important parameters and factors are outlined for the industrial manufacturing process. Formulation, High Pressure Homogenization (HPH), industrial production, milling, modeling, nano-crystalline, nano-suspension, stabilization, surfactant.